Envrionmental activist killed for protesting against the iron sand mining in the coast of Selok Awar-Awar Village, Lumajang Regency, East Java. 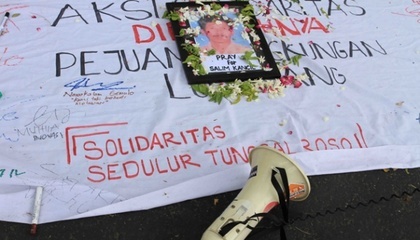 This is the first case of an environmental activist being murdered in East Java. According to the organization Walhi, 13 companies have been granted sand- and gravel-mining concessions by state-owned forestry firm Perhutani, which owns the land”. Each of the 13 companies holds a concession with an average area of 5,000 hectares. The site where the villagers staged their rally belongs to PT Indo Multi Mineral Sejahtera, which holds a concession to operate mining activities on a 4,000 ha plot of land . Moreover, the illegal sand mining has made in this area. The extraction has been in the southern coastal area of ​​Watu Pecak Beach, Selok Awar-Awar Village, Lumajang Regency, East Java. It is located in Selok Awar-Awar village in the Pasirian district, about 18 km south of Lumajang. This area is used for the Hindu ritual ceremony called MELASTI (Larung Sesaji). Also this is a tourist destination for fishing, swimming or for other beach activities. There are already negative impacts of these extractions perceived by local people and activist. The local residents believe the flood soaking their homes in Selok Awar-awar village happened because of the destruction of coastal ecosystems along the southern coast of Lumajang . International and national activist together with local people have claimed to the stoppage of quarrying activities. On September 23 of 2015, the group staged a protest action against sand mining in Watu Pecak Beach. The protest halted the quarrying and blocked dozens of trucks transporting the sand. The protesters claimed that the mining damaged the environment, leaving holes 5 meters in diameter and a meter deep on the beach . 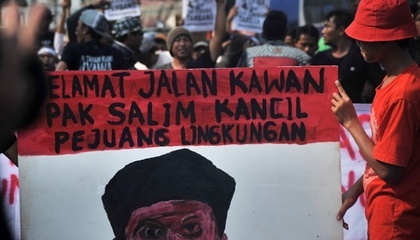 Three days after of these protests, the environmental activist Salim Kancil (46 years old) was reported to be killed by a group of more than 30 men. First he was dragged from his house to Selok Awar-Awar Village, where he was beaten up, and then mortally struck with a hoe on his head. The environmental activist Tosan (30 years old) was assaulted in his home, beaten with wood, stones and farm implements, and run over by a motorcycle. He has been in critical condition at the Hospital. According to Walhi data, Salim's death is the first case of an environmental activist being murdered in East Java. The death of Salim and persecution against Tosan still becomes a mystery . Currently, international and national organization such as JATAM Mining Advocacy Network are claiming to the government and authorities to: Ask police and other related institutions to investigate the case, including find the intellectual actors behind this incident. Protect community's rights to express opinions and to be productive and access productive land from intimidation, torture, murder and land grabbing . Project Details PT Indo Multi Mineral Sejahtera holds a concession to operate mining activities on a 4,000 ha plot of land. Based on 2010 data from the Indonesian Department of Transportation, more than 500 sand trucks with a capacity of 3-16 tonnes leave Lumajang every day. This iron sand is mostly mined illegally - miners often don’t have proper permits; or if they do, have obtained the permits illegally; or otherwise inconsistent mining and land regulations and poor management of licensing systems favours corrupt government officials .